By now, we have our routine for checking into guesthouses and moving from place to place, roaming from town to town and for walking long days in all weather conditions. We have one “Charging Station,” which includes a multi USB charger for our mini iPads, our cameras, iPods, smart watch and phone. We connect it in one place and charge everything every night, so we do not have to remember where around the room, we plugged what. Every morning, we get dressed in one of our hiking outfits (we each have only one extra set of clothing), pack everything in our backpacks, make sure that I rinsed our water bottle and filled it with new water or tea, and make sure that we have some sort of a snack of nuts or fruit, just in case we do not find anything to eat along the way. On sunny days, I started putting baby power on my feet before wearing my hiking socks. I rub every toe and cover it with baby powder. I have not gotten another blister since the beginning of the pilgrimage. If it is scheduled to rain, we double bag our pilgrimage stamp book and everything else, cover our bags and for Jules, we have an umbrella handy. I cannot use an umbrella, because I am wearing my big Henro pilgrim hat, which has a brim that is too large for holding an umbrella. I found that my body does not function well on the diet we were eating, and have decided not to eat any more fish or seafood on this pilgrimage. It is not only because we do not wish to eat the flesh of other sentient beings, but also because I can honestly attest to the fact that fish is NOT good fuel for the body. It is not efficient in giving my body what It needs. At home, where we eat a plant-based diet, I feel much better, have more energy and feel less fatigue. With my normal diet, my sweat and excrements rarely smell, but after a month of eating fish two times per day, I feel very different… and not in a good way. So I’ve decided not to eat any more seafood during the pilgrimage. If the guesthouse will not accommodate our request for an all vegetable meal, I will eat only the miso soup, steamed rice, pickles, tofu and beans and whatever cooked vegetables they serve. So far, in the last few places that we have stayed at, we said that we wanted to eat “Yasai Daké,” which means “Only Vegetables” in Japanese, and thus far it has worked. Jules adds: “The traditional Japanese diet consisted of miso soup, pickles, rice, and fresh mountain vegetables in season. Fish was eaten only on special occasions, because it was expensive to buy, and meat of any kind was almost never served. Sweets were limited to bean paste and mochi (pounded, lightly sweetened rice). Nowadays, this diet has changed quite a bit. Fish is served at least twice a day, there is a lot of meat being eaten, and heavily sweetened drinks are sold in convenience stores and machines everywhere. We learned all about traditional Japanese eating habits years ago from a master of this knowledge, Michio Kushi, one of the founders of macrobiotics, who was convinced that this old-style diet was the healthiest one to follow. In many of the rural areas where we have been walking, there are very few places available for us to stay, and we have been concerned that placing too many restrictions on what we were willing to eat, might result in no one being willing to host us and make us dinner and breakfast. Many people believe that it is the body that limits our freedom, makes us suffer, and at last puts out our life. But from walking this pilgrimage, I can attest to you with every fiber of my being, that THE BODY IS COMPLETELY NEUTRAL. The body is NOT a limit. It will be as strong or as weak as your mind directs it to be. The MIND in the other hand, can be very weak. In my case, if I walk up a steep path, it is MY MIND which gets disheartened. My body knows what to do, and it does it so well. It puts one foot in front of the other, goes up slowly, regulates its breathing so the heart can pump more blood as the muscles need more oxygen, and sweats more to regulate overheating. But it is my mind which actually acts like the old people sitting on the balcony in the Muppet Show. My mind makes all the commentaries, complaining inwardly about the heat, the steepness, the slippery path, the fact that we did not pack enough water, that there is no shade and no place to rest, etc. The body is so intelligent and so adaptable and strong. It is gentle and powerful, with an innate wisdom that is way beyond the “normal mind” with which we operate day to day. The mind that I call “My Mind,” is limited in so many ways. It gets impatient, disheartened, imagines difficulties when there are none, and makes up future scenarios that never come to pass. Today, as we walked in the heat with no shade for hours, my mind started imagining that there would be a cafe, or a grocery store in which we could buy an ice cream. Around every corner where I saw a house, it imagined that the house would be a shop, but it wasn’t. I imagined that I saw flags, which are used to advertise goods in front of shops, but all they were were construction flags, signaling road work. Jules and I joked about the fact that in the last few days, when we were hungry or thirsty and looking for a place to rest, we imagined that hair salons, dentist offices, electronics shops or a community center, were actually lovely, air conditioned places to sit. They look so cool and pleasant and spotlessly clean, as if nobody ever prepared food there. Probably because nobody indeed ever prepared food there, since they were not cafes nor restaurants…. We concluded to our chagrin. Jules adds: “As Tali has said, each weather condition on the pilgrimage presents its own special challenges. With rainy days, it’s nice and cool out, but it also means slogging along in drenched shoes and socks. With sunny, hot days, it’s much easier to enjoy the scenery and the songs of the many birds everywhere, but sometimes, it’s also as if we were wandering in the desert, on the edge of delirium. But the mind that we used daily, is only a tiny part of the Super Conscious Mind which is our REAL MIND and which is available to us, at any moment. All we need is to let go our identification with the small ego-mind and listen to the soft quiet voice of the Spirit within. As we continued walking on the sunny stretches of road, we entered the mountains and walked up a very steep mountain road. The pilgrim path meandered into the forest, becoming a very steep uphill over two mountain passes. 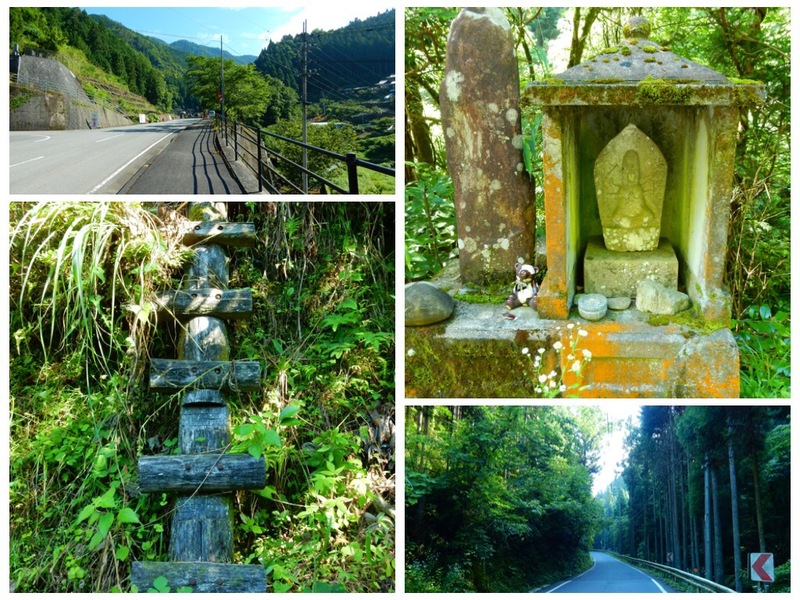 We hiked up the Hatano-Tō mountain pass and the Nosono-Tō mountain pass. We walked by the Ohira river and saw many small mountain villages. In this area of higher mountains, they grow less rice and there are more fruit orchards, and they also farm Shitake mushrooms. We saw road stands selling Shitake and a Shitake log farm in the middle of the forest. Shitake mushrooms are grown on cut logs in a shaded and moist part of the forest. While in the mountains, we came upon a small village and stopped to rest on a bench. A couple of car Henros drove by us and turned around as they saw us. They got out of their car, chatted with us and shook our hands, and gave us two wooden Jizo talismans as an Osettai. They wished us good luck and told us that the temple is still very far. Up the road, we rested again in a shaded rest hut made for pilgrims. We ate some plums that we had bought, and a small bag of nuts. We met a farmer who told us that tomorrow and for the next two days, it is going to rain. He told us that we should not walk in the rain. We nodded, but we do usually walk on rainy days…. Do you know the feeling in which you feel just too tired to care? When it feels like you shouldn’t put so much emphasis on the little things in life, or you’ll be just wasting your energy on nonsense? This is the state of mind that I reached during this pilgrimage. I am not really physically or mentally tired, since I sleep well every night and feel happy all the time. It feels like I have moved beyond caring about the little details, which constantly change anyway. I feel like I’ve reached a point of knowing that whatever happens is just a moment in time, and that the next experience, the next meal, the next town, the next path, the next road, the next guesthouse, the next day or a different weather pattern, is just down the road, and the road is never ending. Why feel upset over a mediocre meal or a crumbling guesthouse, when tomorrow you leave it behind and move on to the next town, the next meal, the next guesthouse, the next temple? The walk today meandered through a high valley following small beautifully clean rivers. There was little traffic all day long and the mountains are beautiful. We arrived in the town of Kuma Kogen, left our backpacks at the information center and walked to Daihōji – Temple 44, with only our shoulder bags, cameras, wallets and our pilgrim stamp book. Daihōji is known as the Temple of Great Treasure. The temple grounds has large Cedar trees, some of which are 800 years old. This temple was originally built by a Korean monk who came to Japan in the year 701. The statue of Kannon was his own personal Buddha. Kōbō Daishi came here early in the 9th century, and rebuilt the temple after it had fallen into disrepair, since nobody was living in the temple to maintain it. Legends say that at one time, the land in this area was inhospitable to growing crops and very few people lived here. When Kōbō Daishi passed through the area, he met a kind woman who lived here alone. He asked her if he could help her in any way, and she said that it would be nice if there was a town nearby where she could meet people. Kobo Daishi changed the course of the river, bringing it closer to the temple. The river brought fertility to the land, and other farmers quickly moved back to the area. The kind, lonely woman had her company. The temple was destroyed by fire in 1873 but later restored. The massive gate of the temple features two beautiful Niōmon guardians and a pair of giant straw sandals (called “Waraji”, in Japanese) which are remade every one hundred years. The temple is very popular with bus pilgrims. Many of them wanted to meet us, and they greeted us with warm and kind words. When we walked back to town to retrieve our backpacks, we met a man who lives nearby in the town of Tobe, on the way to Matsuyama. He was wearing a nice motorcycle outfit made of red, white and black leather. He joined our table and we chatted for awhile. We talked about our walk that day, and he said that he rode his motorcycle and has also visited temple 44 and temple 45 today, which we will visit tomorrow. He told us that he has never been outside of Japan, as he is afraid of flying. When we parted, he bought some fresh, salty bread rolls from a bakery nearby, and gave them to us as a gift. People are so incredibly friendly to us…. Our lodge for tonight is called Yasuragi-No-Yado Denko. We were given a clean Japanese style room with good air conditioning and plenty of clean bedding and clean Yukatas. The shower was good, they have washers and dryers for our laundry, and the toilets are very clean and right outside our room. They had no problem making us an all vegetarian dinner which we ate in their pleasant restaurant downstairs. Beside a couple of women, we are the only guests in the place. We plan to stay here another night, and to walk tomorrow to temple 45 and back, since the road to Matsuyama City and towards our next few temples, passes by Kuma Kogen anyway.